It was surreal, 15 years ago today, watching a chunk of my childhood go up in an enormous dirt plume. Below is the story I wrote with some added changes about a sports venue no one really embraced as they have Citizens Bank Park and Lincoln Financial Field. A large part of that reason was the inanimate, passionless way it stood, like the rest of the other cookie-cutter places to watch ballgames in the 1970s. It did house a resonating nightmare that occurred on a Friday afternoon, October 7, 1977, when the Phillies were down to their final strike from going up 2-1 in their best-of-five National League championship series to the Los Angeles Dodgers and blew it. It also was home to the first World Series in Phillies’ history and an NFC championship victory over the Dallas Cowboys that no Philadelphia sports fan will ever forget. In one plunger push it was finished. Over the passing days it had stood there more like an ancient concrete relic, one section already torn down, but cause enough for motorists to stop in the middle of Pattison Avenue to absorb one long lasting look. Some fans used it as a backdrop for family pictures -- keepsakes to show their grandchildren where they watched baseball growing up. In 62 seconds, Veterans Stadium collapsed into a 50-foot heap of dirt, crushed concrete and twisted steel. The Vet took its last breath when Demolition Dynamics Company imploded the building, after former Phillies slugger Greg Luzinski and the Phillie Phanatic pushed down the symbolic plunger, setting off a series of booms that toppled the Vet inward like a gigantic concrete domino set, starting in the southwest corner and working clockwise. The large dust cloud drifted northward into Citizens Bank Park, the Phillies' new home, and evaporated quickly. It was a bizarre scene that attracted an estimated 3,000 fans milling around in restricted areas, swirling helicopters, construction workers in hard hats, and rows upon rows of TV trucks and news vans, making the implosion as much a media event as a World Series game. Phillies public relations director Larry Shenk handed out 248 media credentials, including one to a German TV station. A shadowy line of fans started to form across I-76, which runs adjacent to the Vet, as early as 5:30 a.m. The Vet housed the Phillies since 1971. To some, the implosion was a time for rejoicing, to usher in a new era of Phillies history and a new ballpark, Citizens Bank Park. For others, it was a time to reflect on all of the good times the old place provided -- especially for those who worked there. Mike DiMuzio, the Phils' director of ballpark operations since 1982, has been at the Vet since it opened on April 4, 1971. DiMuzio was a member of the junior grounds crew that opening day, replacing second base. In the final game of last season, DiMuzio repeated the honors, and last Wednesday, he stood one last time where second base once was. DiMuzio said the impact hit him in three stages: The last game of last season, when he changed second base; on January 9, when the Phillies actually moved into Citizens Bank Park; and finally Sunday, when the stadium came tumbling down. "From day one to the last day, I've been at the Vet, so that's why it's so tough for me," DiMuzio said. "I shed a tear when it came down. I shed a few tears before it came down. "I spent 33 years of my life in that stadium, so most of my adult life was spent at the Vet. Most of the people I've met, other than old high school friends, I met while I worked at the Vet. Consequently, some of the people I knew at the Vet have passed. That's why it's so emotional, because when it came down, I remembered them. I'm not a materialistic person, but this building got a hold of me." Chris Long was another long-time Vet employee who was sorry to see the building fall. Long, the director of entertainment, started working for the Phils in 1971, as a secretary in the promotions department. "It was bittersweet for me," Long said. "We're moving into an exciting new ballpark, but I spent most of my adult life at the Vet. I'm a little teary eyed, but that's been the last few days, particularly today." Three generations grew up watching Phillies baseball at the Vet. They watched the franchise during its most successful run win its only World Series there in 1980, take home three National League pennants ('80, '83 and '93.) and seven National League East Division titles (1976, '77, '78, '80, '81, '83 and '93). One of the central figures of the Phils' '93 pennant winner was relief pitcher Mitch Williams, who was there Sunday with Luzinski and another Phillie alum, Larry Christenson. "There's some mixed emotions, because I played at the Vet, but it is time for a new stadium," said Williams, who struck out Atlanta's Bill Pecota to record the final out of the '93 National League championship victory. "I brought my kids with me to watch this, because I like to watch stuff blow up." Brandenburg Industrial Service Company handled the demolition and Demolition Dynamics Company took care of the implosion. DDC's previous work included demolition of Exhibition Stadium in Toronto, Fulton County Stadium in Atlanta and Cinergy Field in Cincinnati. Over the last six weeks, DDC drilled 2,800 holes in the remaining columns. Explosives were packed on Monday. Roughly 3,000 pounds of dynamite was needed to bring the Vet. The debris will be removed shortly from the site and the area is intended to add 5,000 additional parking spots in the Sports Complex when the demolition is completed this fall. When the final stages are complete, the Phillies will commemorate the Vet by painting an outline of the Vet's playing field, commemorating the stadium with granite markers at the former home plate, pitching mound and base locations. 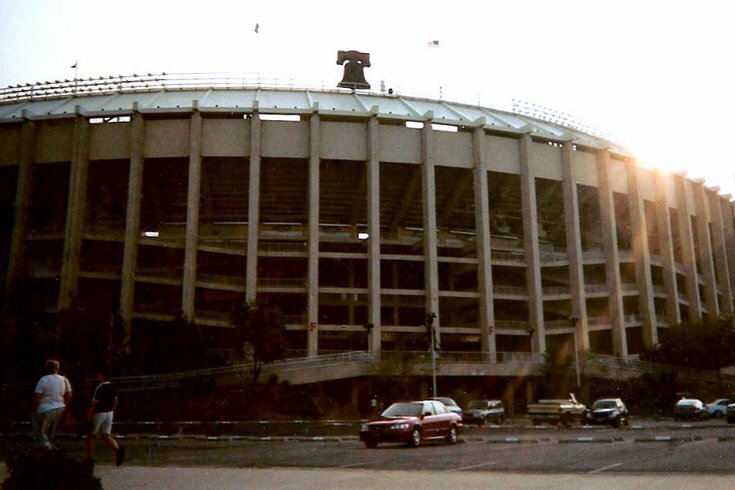 Like it or hate it, the old place might have been the reason why the Phillies captured their first and only World Series in 1980, against the Kansas City Royals. In Game 6, with the bases loaded and one out in the top of the ninth, Frank White's foul off the late Tug McGraw arced toward the Phillies dugout. In the new, smaller ballparks of today, the ball would have been out of play. But at the spacious Vet, it provided one of the lasting memories all Phillies fans will carry with them forever, when the foul popped out of catcher Bob Boone's glove and deflected into the glove of Pete Rose. McGraw struck out Willie Wilson one batter later, marking the pinnacle of Phillies history -- and the venue once known as the Vet. "When I saw people on Broad Street line up yesterday, stopping and taking pictures in front of the stadium with family, that's when it hit me," said Shenk, who has been the Phillies' PR director for 41 years. "It was a little emotional for me watching it come down, but not as emotional as I thought. "It was pretty impressive the way they did it, but it was sad. I'm a fan of the Vet. I know through the years the place got a bad rap. The elevator occasionally didn't work, but it came down today. We lost the building, but we won't lose the memories."